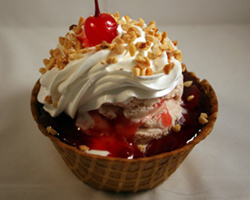 Our ice cream is freshly made in our shop daily, starting with a rich 16% butterfat base. Our milk comes from hormone-free cows that graze in open pastures. Most of our flavors are gluten free and do not contain eggs, but please call us at (415) 648-2300 to ask about specific flavors if you have a gluten or egg allergy. 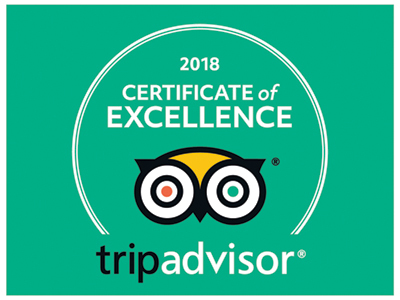 Enjoy our award-winning, super-premium ice cream and sorbets—in Cones, Cups, Sundaes, Milkshakes, Smoothies, Ice Cream Sandwiches and Ice Cream Cakes. Give your loved ones the gift of ice cream. Our cards can be purchased in any amounts. 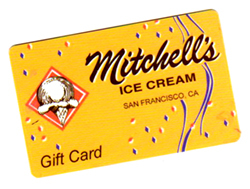 They make the perfect gifts for friends and family who love Mitchell’s Ice Cream. Or, send them a Mitchell’s baseball cap, a tee, or sweatshirt! Visit our online store to purchase gift cards & more!